At the heart of the Subscription Economy is the idea that customers are happier subscribing to the outcomes they want, when they want them, rather than purchasing a product with the burden of ownership. ...Nicely put by Zuora, the SaaS platform company that drives many of the largest subscription services. They have popularized the term "subscription economy," and recently created a Subscription Economy Stock Index that highlights the striking growth of such businesses. This is not just a Zuora thing -- as the Oracle infographic to the right indicates. This fundamental shift toward subscriptions is driven by the nature of our digital environment, and the power of Big Data and the Internet of Things. It is becoming easy to manage ongoing subscription relationships and service delivery -- and to get increasingly rich understandings of actual value received. We are only beginning to recognize how deeply this will transform how we exchange value in commercial relationships. 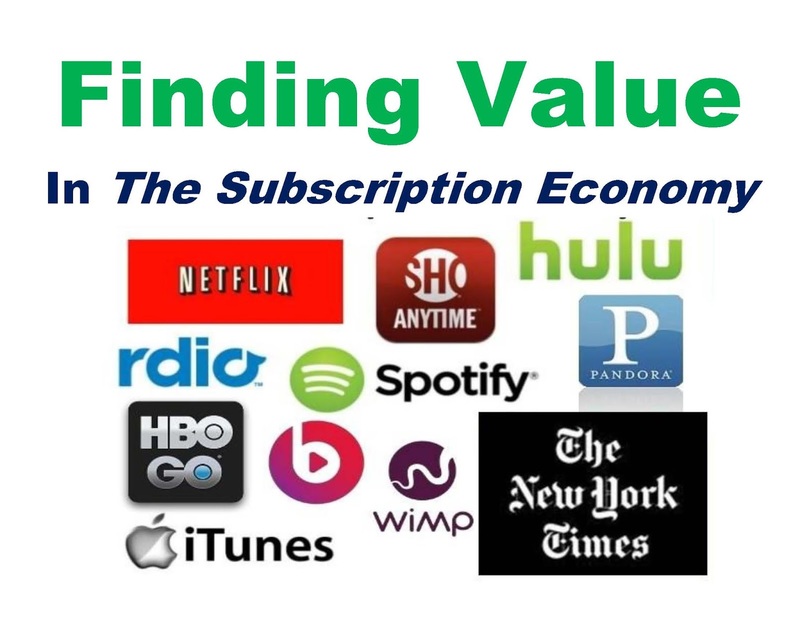 This post explores the key concepts of value as they apply to subscription relationships -- and as they are are embodied in the pricing of subscriptions. This draws on "value-based pricing" strategies that shift from simple (but less optimal) cost-based or competition-based models. (These are increasingly transforming B2B markets, but have so far seemed less readily applied to B2C markets. FairPay, a new approach to value-based consumer relationships, promises to change that game.) This post shows why shifting toward value-based pricing -- even if only in small, incremental steps -- is vitally important to maximizing the value of subscription relationships -- Customer Lifetime Value (CLV). [UPDATE 4/20/17:] Think of this is "value discrimination." Marketers and economists think about "price discrimination" as the way to be efficient about getting the most revenue from each customer. But in recurring relationships, what we really want is value discrimination -- finding the optimal value proposition for each customer. Value discrimination involves optimizing not only the price, but the value of the product/service package that is provided for that price. Our digital age has not only driven "relationship marketing" to become deeper and more powerful, but has changed the economic realities of value -- shifting focus from "value in exchange" to "value in use." That is what the opening quote from Zuora referred to, "the idea that customers are happier subscribing to the outcomes they want, when they want them..." We generally do not really want products for their own sake, but as services that produce outcomes. Subscriptions are not a product with a set value in exchange, but a structure for a service relationship that produces a dynamically varying value in use. Current subscription models drive toward this idea of value-in-use, but do not yet fully embrace it. Our concepts of value and value-in-exchange are still rooted in the old logic of products ("goods"). Value-in-use can not be known until after use. Not only does value vary from subscriber to subscriber and from period to period, but there are many factors involved in estimating value. Is the value tied to the period of access and/or the amount of access (permitted or used)? Is it per unit of product/service? Is it how well the service met quality or service-level standards (performance)? Is it what the experience achieved, what benefits it led to, or how well liked it was (outcomes, whether objectively measured or in customer perception)? Is it a matter of broader values, like cultural merit or support for social/civic/environmental values (including economic "externalities")? Is it affordable to me (willingness/ability to pay), and does what I pay sustain creation of more content or services that I desire? An ideal market system would factor all of these aspects of value into pricing. For example, the value of a content service is not just how many songs or videos or stories I have access to, nor how many I do access, nor whether they arrive without halts or delays, nor whether I play all of an item or hate it and stop, nor whether the service pays its creators and employees, and avoids pollution, nor whether it is priced within my means. Ideally it is a reasonable combination of all of these. the objective and subjective results of the experience. Marketers are already using newly available data to target their offers, and to factor better predictions of value into their pricing. But subscription pricing strategies are just beginning to address the gap between average predictions of value and the widely varying actual experiences of individual consumers. Consider the range of approaches to price that we commonly see in practice and how they track to value. Keep in mind the fact that value in use, the outcome of a service, is difficult to predict in advance, and varies from customer to customer and time to time -- and so is best assessed after use, when the outcomes are known. There is also the problem that important subjective value perception data arises from within the head of the consumer -- that aspect of value can be hard for the business to know, even after the fact. Uncertainty in quantifying value realization forces us to address the related question of who takes on pricing risk? This has important implications. How much use will I get from my subscription? Must I lock in a package rate to get a volume discount, and then have to wonder if I will use enough of the package to get the value expected? What if I use it, but am disappointed? Pre-setting prices puts the pricing risk on the consumer (causing many to refuse to take the risk at all, resulting in lost revenue), and often leads to disappointed customers (which hurts customer retention, thus reducing future revenue). As practitioners of value-based pricing recognize, offloading pricing risk from the customer is a service, and one that can increase sales and loyalty. Think of it as pricing-risk-management as a service. For digital services (which typically have near-zero marginal cost for unlimited replications), businesses have little to lose by taking on pricing risk (as long as they manage that risk effectively). Pre-set packaging of an assortment or bundle of items or services in a subscription. Do you have run-of-the-house access to a full range of items or services to choose from, as you decide you want them, or must you choose a specific assortment or bundle in advance? This comes up when you subscribe to TV channels in bundles, or to NY Times news plus crosswords, or support a museum or a musician on Patreon, and choose from multiple packages with different perks at different prices. Do you know in advance what combination you will want and how you will value it? Pre-set usage levels. If you subscribe to a service, does the price depend on how much you use it, building in volume discounts? Other things being equal, a customer who uses many articles, songs, programs, or whatever, per period will presumably get more value than one who uses only a few. Does the price reflect that? Unlimited usage plans do not -- so heavy users get a bargain, and light users subsidize them (and may not find it worthwhile to subscribe at all). Beyond that, usage-related pricing generally tracks better to value when it applies volume discounts, as with mobile data plans, and TV channel bundles. (Such prices can vary a unit at a time, or be fixed within set usage bands.) Volume discounts can factor in both diminishing returns to the customer and economies of scale to the supplier. Pre-set price schedules. Even when pricing depends on usage, and offers volume discounts, that usage is most commonly priced using a pre-determined price schedule, which presumes some average quality of outcomes. More advanced value-based pricing approaches can allow the price schedule, itself, to depend on actual outcomes. For example, the price of an article or song or video may depend on the value I actually get (/perceive) from it. One simple example is when a sales commission depends on the price obtained for the sale. Outcomes pricing is generally not done in current consumer subscription plans (but is a feature of the new FairPay strategy). Whatever the particular form of pre-pricing, the business must try to predict pricing levels (/tiers/packages) that work on average, but will inevitably work poorly for the many consumers who diverge from the average in one way or another. To the extent that such pricing decisions can be deferred, greater price discrimination can be achieved in a fair and transparent way. That leads to better economic efficiency, higher profit, and happier customers. The established wisdom of subscription economy businesses is that it all about Customer Lifetime Value (CLV). The problem is that this is generally viewed from a one-sided perspective -- value to the vendor. But value to the vendor is maximized when the relationship is win-win. It is a matter of fair balance -- maximizing CLV requires equal attention to how the customer values the relationship: Vendor Lifetime Value (VLV). It is costly to acquire customers, and therefore it costly to lose them and have to replace them -- recurring revenue models work best when the revenue recurs. Customers are retained when they feel they are getting good value for their money -- for what they really want. That is especially likely when they feel the business is listening to them, understanding what they value, and seeking to deliver that at a fair price. To the extent that we can migrate toward pricing methods that offer better mappings to value-in-use, customers will be happier and more loyal, and move toward maximum CLV (and VLV). It is easy to get lost in the mechanics of pricing and subscription models (which are complicated and full of compromise) and lose sight of the underlying goal -- to find a right price, for each customer -- a price that each customer will view as fair compensation for the value they seek. We are so used to the compromises and nasty zero-sum games that are the dark side of the past century of mass marketing, that we often descend into a cycle of exploitation on both sides. Businesses treat the consumer's perception of the total value proposition as something to manipulate and exploit, and, as a result, consumers distrust businesses and try to "hack" them. But as businesses become "customer-first" and oriented to "customer experience" (CX), we see that what really matters is cooperating in a joint, effort to co-create value, to maximize "value experience" (VX). A few decades is a long time in our personal lifetimes, and that makes it is easy to forget that we are still in the infancy of the digital era, with many deep changes yet to come. But we do see that a few decades into the digital era we are still in a time of continuing disruption and turbulence. As Peter Drucker said, "The greatest danger in times of turbulence is not the turbulence, it is to act with yesterday's logic." Moving toward value-based post-pricing will move us toward tomorrow's logic -- to reduce the cost and risk in how poorly prices track to value. It is that new logic that will fully realize the value in the subscription economy. A more detailed view of how this plays out in subscription pricing plans is outlined in the following list (drawing on an earlier post, Beyond the Deadweight Loss of "All You Can Eat" Subscriptions). Looking at this progression, ordered roughly in accord with the degree of value-based post-pricing, it becomes apparent that we are only at "the beginning of the beginning" of our evolution toward a commerce for the digital era. Unit sales of items (pre-priced). This is the pre-subscription base case. Examples are song/album, video, e-book, and article ownership downloads (with or without cloud repositories). This is simple and easy, but tracks to value only on average -- and as predicted, not as realized. It is a bargain for heavy users of specific items, but costly or prohibitive (and a management problem) for light use of many items. All You Can Eat (AYCE), unlimited subscriptions (pre-priced). The common model of all the items you want, time-limited to periods of subscription. This too is simple and easy, but has similar kind of unfairness and inefficiency -- still tracking to value only on average (overpricing light users and underpricing heavy users), and considering value only as to the predicted average experience, not the value-as-realized. Many potential subscribers who are unsure of the value or how much they will use (or expect it will not be much) are disinclined to subscribe. Often referred to as paywalls (with all the exclusionary connotations of a "wall,") these also include tiered variants with levels of premium access, including freemium versions that begin with a free tier (but still place a paywall at some pre-set premium level). Membership models (pre-priced). These are a form of subscription with a more cooperative, participative orientation, such as for publications, artists/creators, or museums -- sometimes using crowdfunding platforms like Patreon or Indiegogo. These may seem more voluntary than hard paywalls, and often include tiers or bundles that include different levels of perks, but still have pre-set prices for given levels of service (see pre-bundling, below, and note that these perks, such as T-shirts and tote-bags, are often gimmicks of questionable value). Partially usage-related subscriptions (pre-priced for the most part). These improve on unlimited models by adding usage-related tiers, such as for varying levels of mobile data service, how many TV channels are viewable in a bundle, or how many DVDs or e-books you can have out at one time. In most cases not only are the price schedules pre-set by the seller, but the customer must pre-select which specific tier or bundle they want. These can track better to value, in terms of usage, but only based on pre-defined units of usage -- without considering the experiential value of that usage. Fully usage-based subscriptions (pre-priced schedule applied to actual, metered usage). Currently, these are most widely accepted in B2B, such as jet engine "power-by-the-hour" and fleet "tires-by-the-mile." These have also been used for B2C, such as the old "per-minute" charges for mobile phone and dial-up Internet services. Consumers often dislike these plans because of the unpredictability of both usage and value, and the relentlessness of the "ticking meter." However, in some B2C uses the tracking of usage units to value can be quite satisfactory. Tire miles and engine hours are manageable and serve as a good estimator of the broader business outcomes. Pre-bundled subscriptions (pre-priced menu). These can be forms of any of the above in which the customer is given a set menu of options (pre-set, tiered packages) to select from at pre-specified prices. The use of tiers and packages with appropriate volume discounts leads to a better fit to value (for the tier or package), but in a very static way -- it forces the customer to select a tier or package before knowing if they really want it and will find value in it, and sets the value based on predicted averages, not actual value in use. Post-bundled subscriptions [new] (post-priced in part based on actual usage -- but still based on pre-set volume discount schedules). This is an enhancement of conventional subscriptions that I have proposed, such as for TV services, that offers discount prices at levels comparable to current TV bundles, but with the composition of the bundle set after the fact, so that customers can watch whatever channels they want, while still benefiting from a bundled-rate discount. This can track significantly better to value as it varies from customer to customer and month to month. It does not directly address outcomes (did you like that program? ), but refund options can be provided (for each program view) to add a degree of outcomes tracking (duds are free). Performance/Outcomes-based pricing (post-priced based in part on actual usage, with a price schedule that is based on performance or outcomes). This goes beyond usage alone, to factor in the quality or result of that usage. Performance-based pricing is common in digital advertising (clicks, leads, transactions) and other B2B markets. Outcomes-based pricing takes that farther up the value ladder, and is increasingly applied in healthcare (where the price schedules are typically set in advance, based on prior results in test populations). Of course it would be more desirable to base the schedule (at least in part) on actual individual customer outcomes, where that is feasible (pay if cured). Soft values as pricing factors (pre-priced or post-priced). This adds consideration of broader values in the overall experience, like cultural merit or support for social/civic/environmental values. Conventionally, this is rarely an explicit factor in pricing, but some aspects are increasingly implicit in prices, in the form of a tacit understanding that consumers are OK with paying a premium for goods and services that support broader human values and/or are produced and delivered in socially responsible ways. FairPay subscriptions (/memberships) (post-priced, with price schedules set after usage). This is the new value-based strategy that shifts to an adaptively cooperative process for "dialogs about value" that get finalized after usage to create the best practical approximation of price to value in use. (FairPay also applies elements of participatory pricing to optimally factor in the customer's perception of value-as-experienced.) FairPay is designed to co-exist, at whatever level desired, with the other methods above, and to be able to subsume them in a flexible architecture for collaborating on value and price (co-pricing). More about FairPay and how it can adaptively seek the best of all of these approaches is addressed elsewhere in this blog. It is not yet clear how widely applicable FairPay will be, but it points to many aspects of deeply value-based strategy that will almost certainly be important in one form or another.